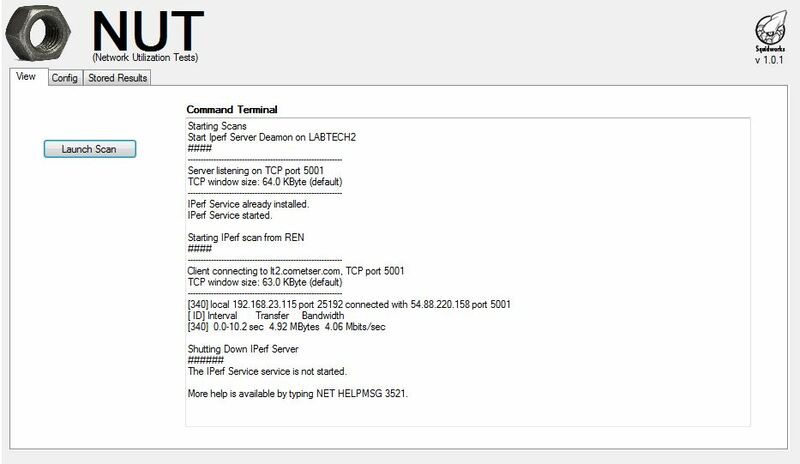 NUT uses IPerf to test between 2 endpoints. When launching a scan with NUT we send commands to both systems to start the IPerf executable. The Host side and the Client side sessions are sent start up commands and the client is then pointed to the host to run the configured scan options. Once the scan is complete the results are returned to the plugin console menu. The Host side must have firewall access on the port and protocol you select (default is 5001 and TCP). You will also need to supply a FQDN or routable IP address for the host system to allow the client to locate the host system across the internet and to connect. You can select TCP or UDP protocols and how long to run the test from the config menu. In version 1.0.1 we are forcing the host side to be one system under client 1. We are using our LT server as the host side and have opened up ports to allow UDP and TCP testing on port 5001. You can select any system to be a host just remember to make sure to allow firewall access to host and that host has a external FQDN or IP to allow access from other locations. In version 1.0.2 we added the servers at any clients location to be added to the Servers side of the IPerf testing. Fixed a could minor display issues.